If I recall correctly, I couldn't get the new one to install without the empty hidden.vbs file. So I ended up needing it to uninstall and install. No worries for me at this point, as I got it working. Does the PTT seem to be working ok in 0.0.10.0? I am interested in this app and getting it set up on the US Central Server. It would be nice to get some people to do dedicated atc. Does it work with the most current version of Teamspeak? Thanks. It actually doesn't speak to Teamspeak at all. I came about as I could see ATC on the JoinFS Map. I thought, great I'll fly there and give them a call on the way. But I had no idea what Hub they were using, what group they were apart of, or what voice server they were on. When I took the time to find out, I'd then find that the server or channel they were using was locked to members only, totally understandable with the amount of idiots that like to spoil things. SIMCOM X is standalone and runs alongside your groups existing voice comms. It is built with the Teamspeak SDK, but this is different to the actual Teamspeak and the two can not talk to each other. 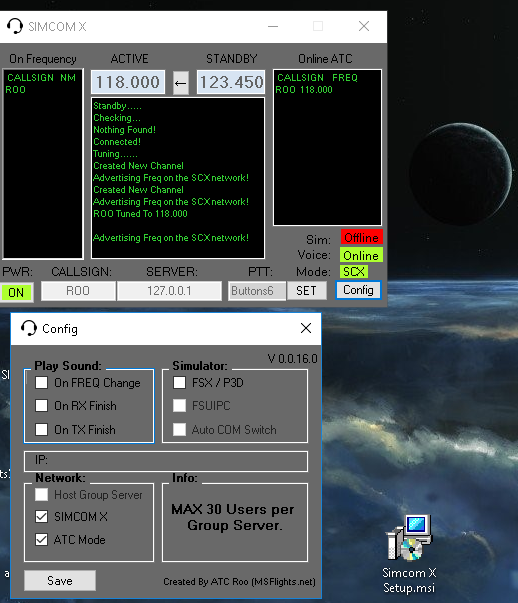 If you're looking for something to just switch channels in the normal Teamspeak, I have links to the SIMCOM version I wrote (with lots of help from Doug Dawson of FSDEVELOPER) and the SIMCOM version Andy Parish put together that uses FSUIPC, on the MSFlights.net forums under the ATC section. This project isn't abandoned for those interested. I just haven't had much time with the projects I have on. The next release will have new features and should work quicker. Anxiously awaiting the next update! Roo, I have been experimenting with your simcom.x and have been unable to achieve a connection with another person. We both have port 9988 UDP forwarded and he has an exception in his Windows firewall rules. I have Windows firewall off and an exception in Avast. What we are attempting is me in "ATC" mode SCX connection and him as client. I am just not sure what we are doing wrong. Any chance of getting together on the MSFlights discord and trying to sort this out? edakridge wrote: Roo, I have been experimenting with your simcom.x and have been unable to achieve a connection with another person. We both have port 9988 UDP forwarded and he has an exception in his Windows firewall rules. I have Windows firewall off and an exception in Avast. What we are attempting is me in "ATC" mode SCX connection and him as client. I am just not sure what we are doing wrong. Any chance of getting together on the MSFlights discord and trying to sort this out? Sorry I've not been around for a month or 2. I am still working with it although have to admit I've neglected it a bit lately as I've got lots on. I'll try and get on Discord soon or at least put together a bit of a how to for the current version. All I can say at the moment is that it does work in its current state. I'd try with one of you as a host and the other connecting with the hosts IP first off. Once that's successful, both try SCX mode. Good news I've had time recently to have a look over my code and speed things up a bit. I've also added reduced audio quality the further you get from another user. All untested at the moment, but I have uploaded the latest version (0.0.16.0) if anybody wants to test it. Below is a picture of my settings for those having issues, as I haven't had the time to write a how to. Download is still hereThis is still very much BETA and meant for testing!